For rigid scales, you're better off looking at the tutorial for doing it with metal. This tutorial deals with making leather armour out of split hides or sewing weight leather or suede. What will you need? About three sides of split leather, for a generously-sized tabard (shin length on me) (I got mine from ebay for £11 each), sewing machine, good thread in same colour as leather, ruler. Can't remember but relatively quick due to making the scales in rows. First, make yourself a tabard or tunic in the size, style, and length you want, in the same material as the scales. For tabards, see the tutorial on simple costume. Then, decide on what shape your scale should be. I went for a sort of half-leaf shape, about 5cm wide by 5 high. This was for maximum tessalation but with a nice tapered shape. Get some old crappy photos that you don't want anymore, or some cardboard. Photos work best as templates and are more durable. Carefully measure and draw a row of however many scales will fit, side by side, with a margin of about 1cm at the top edge of the scales (I did two templates of three scales each, fitting onto a 15cm photo). Cut this out. Get a non-offensively coloured biro, pencil is tricky to see on suede. Use tailor's chalk if you have any. Find the straightest edge of your hide and draw a long straight line. Make sure it doesn't bend or you'll have a nightmare sewing them on straight. Lay the straight edge of your template on the line and draw around it, all the way to the end. Do your next row of scales so that the pointy bits tessalate into the spaces left by the first row. Fill your hide with rows of scales. Make sure you draw single scales in any little areas that are too small for a row, you'll need single ones as well. Cut out all your rows of scales. You can now draw equally spaced lines on your tabard for where you want all the rows to go, but as the leather might slip around as you sew it on, you're as well to do it by eye, but make sure that the lines stay horizontal as you move up the tabard. Starting at the bottom, sew a row of scales on, so the scales come over the bottom edge of the tabard. Trim off when you get to the end, making sure you keep any half-scales as you'll need them later. Place your next row over the first row, so that the tips of the scales just cover the join of the scales in the first row, and sew on, covering the stitching of the first row. 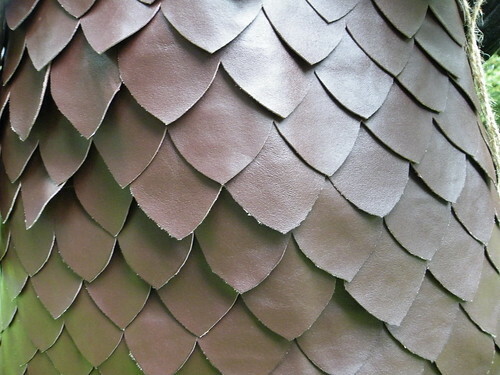 Try to stop the leather slipping around as otherwise the scales may end up not fitting perfectly with the first row. This is bound to happen eventually and is frustrating, but fear not, you can fix the problem by cutting the row and either slightly lengthening or shortening the distance between scales to correct any slippage introduced by the sewing machine. Fill in the ends with half scales - obviously each alternate row will have to end on a half-scale for the pattern to interlock. Do this, all the way to the top. With odd scales, or more rows, you can neaten up the neck hole and shoulders in whatever manner pleases you. When you're finished, to make the half-scales sit flat, I'd run a row of stitching down each vertical edge. This stitching will be visible but it keeps the half-scales sitting neatly. (One advantage of this simple, open-sided design is that it'll fit pretty much anyone, from small me to larger larpers: see?